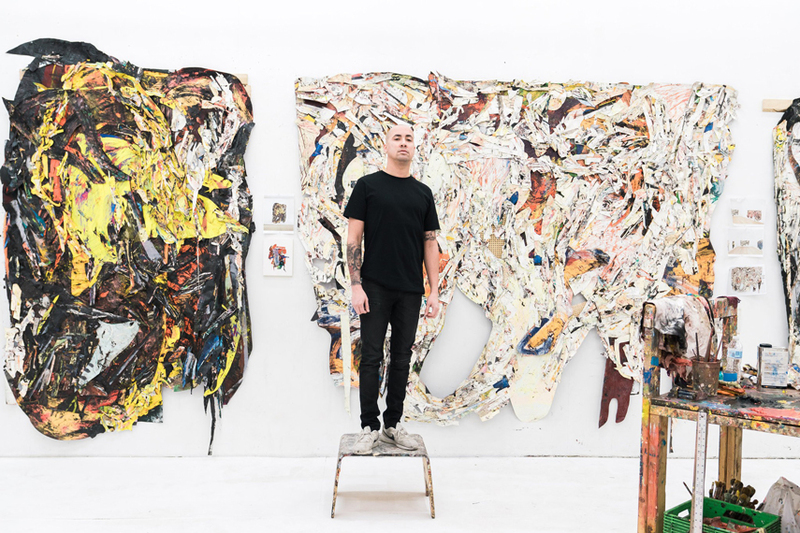 Angel Otero (BFA 2007, MFA 2009), courtesy of Jacob Pritchard and "T: The New York Times Style Magazine"
Angel Otero (BFA 2007, MFA 2009) was profiled in T: The New York Times Style Magazine about his upcoming solo exhibit Milagros and on opening a second studio in his first home, Puerto Rico, early this summer. “I want to see what can happen if I am physically there, working and engaging with people,” he explains. “I’ve always been a loner and introvert while making art, and I want to break this habit there, and maybe even bring people into the studio to make art together," he says. His new works, which reuse pieces of old paintings and discarded objects, revisit memories of his childhood home. "The exhibition’s title, “Milagros,” ties to my grandmother and little charms she inherited from her great-grandmother. They’re wooden religious figures people carved as tokens of promise. If the promise came true, which was considered a miracle, they would go to a man to recreate the object in metal. I relate the works in this exhibition to that idea of re-creation," he says to T.